More than 1,500 starving sea lion pups have washed ashore on the California coast this year, many of which are on the brink of death. Animal rescuers are overwhelmed with calls to save them. A weather phenomenon caused by global warming may be to blame. The emaciated pups are arriving at more than five times the normal stranding rate in the Golden State, from the shores of San Diego up to San Francisco. Many are sick with pneumonia. Parasites have swarmed their digestive systems. Some are so tired that they cannot scamper away when rescuers ‒ or predators such as dogs ‒ approach them, the New York Times reported. 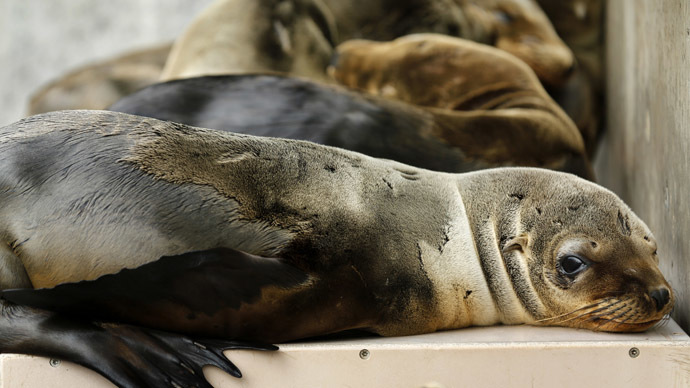 Peter Wallerstein, director of Marine Animal Rescue in Los Angeles County, said his center is overwhelmed by the record number of sea lions in need of help. "I've had more than 200 so far this year," Wallerstein told KNBC. "So, we've doubled our rescues and there seems to be no end in sight." SeaWorld announced last Friday that it was canceling its sea lion and otter show for at least two weeks. Instead of performing, the trainers will help the park’s Animal Rescue team to provide aid to the sea lions stranded along the San Diego coastline. 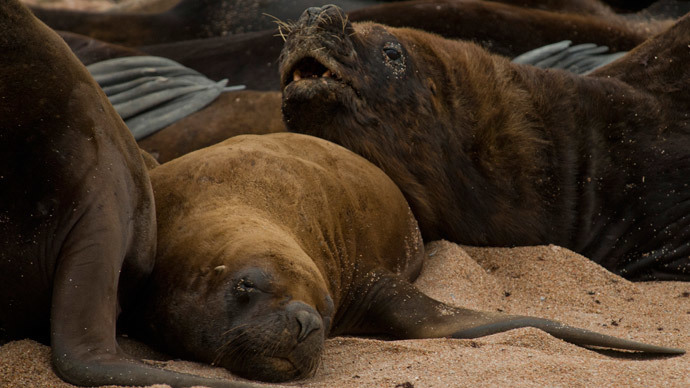 Experts believe this year's El Niño-type conditions ‒ bands of abnormally warm water have swept up the Pacific Coast since the waning months of 2014 ‒ might be responsible for driving sea lion prey deeper into the sea. NOAA has not officially declared an El Niño, however. With the animals’ prey further away from their nesting grounds on the Channel Islands ‒ an eight-island chain off the Southern California coast ‒ mothers are leaving their pups for longer periods of time to hunt for food. The babies then begin to starve. 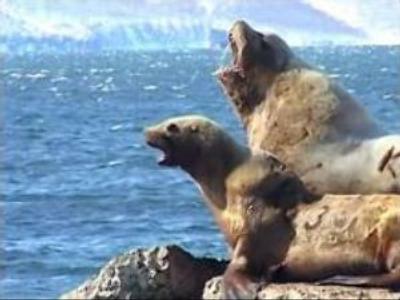 “The prey source is just too far away for the mothers to go out, get food and come back and wean the pups,” Jim Milbury of the National Marine Fisheries Service (NMFS) told Yahoo News. The pups then try to fend for themselves, but they are too young to travel far, dive deep or truly hunt on their own, scientists told the Times. The sea lions are turning up under fishing piers and in backyards, along inlets and on rocky cliffs. One was found curled up in a flower pot. Even the pups that remain on the Channel Islands are suffering. 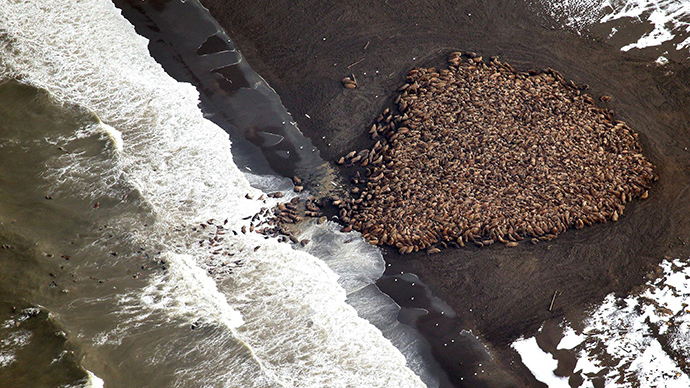 The NMFS ‒ a part of NOAA ‒ found that pups on the eight islands were 44 percent underweight, Common Dreams reported. Sharon Melin, a NMFS wildlife biologist, blamed climate change. The ocean is up to five degrees warmer in the northeast Pacific and off the West Coast ‒ probably a record, Mantua told the Associated Press. The same high-pressure system has caused has a four-year drought in the state. The world experienced record-breaking ocean temperatures in 2014, and, for the first time, the rising measurements were not due to an El Niño phenomenon at the beginning of the year.